What does your audience want to do? Once you identify those two main things, your site organization will come together surprisingly well. We’ve all been frustrated by websites at some point or another that seem to bury the information that you came looking for. You go to a site, can’t find what you had hoped to find, & leave the site with a bad taste in your mouth. That is not the experience that you want your customers to have! If people want to see your menu, make sure that the menu is easy to access (from mobile as well). If people want to check your hours, don’t make them go digging for it. If people want to read your latest blog post, have it right there on the front page. If people want to buy jewelry, don’t make them jump through hoops. Hopefully you already have an idea of what people want to do when they visit your site, but if not, you can always gain that type of feedback by asking friends, family, your customers, or by using UserTesting.com. You always want to give the customer what they want, but you also have a business to run. Take the time to consider what you would like your audience to do when they arrive on your site? Do you want to educate them about a certain topic? Do you want them to start drooling over a product? Do you want them to engage in the online community? Do you want them to reach out & get a quote? Find a way to intertwine these goals into a great user experience so that your customers enjoy spending time on your site. 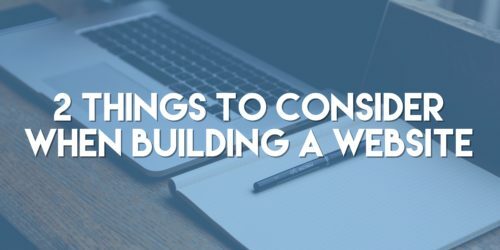 There are ways to organize the site layout so that you can urge customers to do what you’d like them to do without throwing pop-ups in their face. Once you consider these two main points, get creative with how you are delivering those objectives. Have the site design flow with the site layout & the content that you want to present. Keep things simple, make things efficient, give people what they want, & then make them want more. Subscribe to the Push Pull Sales & Marketing podcast on iTunes or Stitcher for more insight & ideas.